It seems like there are more pianos in storage today than I’ve ever seen in my last 35 years in the business. Maybe it’s partly due to the economy shrinking several years ago. It could also be because people are so much more mobile today than they’ve ever been. So when they move, they can’t take all their stuff with them, right away. Because such a large portion of my business is dedicated to piano storage, I thought it would be a good idea to talk about the things that are important to the people who are considering storing their piano. It also gives me a chance to put accurate Information about more than just storage. Since it’s important to have the piano moved properly, and kept in a stable environment, I’ll talk about those things too. Pianos hate change, especially a change in humidity levels. If you’ve ever seen your wood floor swell and buckle in the summer or crack wide open in the winter, you know what I’m talking about. The swelling is more likely to happen in homes where folks don’t air condition in the summer. The wood absorbs moisture from the air and expands. As two pieces of wood expand into each other they have nowhere to go but up, so they buckle. Believe it or not, a soundboard is kind of like a wood floor. It’s made up of long pieces of spruce that are butted up against each other and glued. When these pieces of spruce absorb water they begin to swell and press up against each other and they begin to buckle. These buckled areas are called pressure ridges. So a piano that’s kept warm and dry in the winter and warm and moist in the summer, gets the most stress. A reasonable humidity range is between 40 and 60%. Keep in mind, a minimal amount of fluctuation in the humidity level is what you want to strive for. 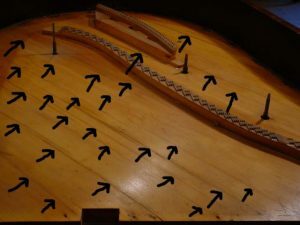 Compare the wood in your piano to an elastic band. Each time you stretch it and let it contract, it becomes less resilient. If the humidity levels fluctuate widely, out of the 40-50% range, you can control the humidity in the house with a humidifier or air conditioner. If you have an HVAC, forced hot air system, there are a number of manufactures of aftermarket humidity systems that can be installed by and HVAC professional. That’s a lot of info about humidity, wood and pianos and this is supposed to be a blog about piano storage. But, humidity control is so important to the long term health of pianos, I wanted to stress its importance. Be sure the facility you use has straight forward fees. Early retrieval fees, extra insurance fees, non-clear fees as the pickup and delivery of the piano, are a bad sign. Wherever you decide to store your piano, make sure the company has insurance and is registered with the state agency that regulates moving and storage in your state. You can check that a business is insured by having their insurance agent send you a copy of the business’ insurance certificate. The NJ Board of Public Movers and Warehousemen regulates moving and storage facilities in NJ. They require all legitimate companies to register with them and have proof of insurance on file at all times. Any consumer can call that agency and inquire about any moving and storage company in NJ. Other states probably have similar agencies. When I’m considering the quality of a small company’s products or services, I realize that it is directly related to the integrity of the individuals in that company. I can usually get a sense of the person I’m speaking to on the phone. I also make my judgments based on their website and their email correspondences. I also like to visit them in person, on things that are important, when I can.